Buying and reading old books is a fun activity. Old books have a charm of their own. As a child, I had an aversion to them and to the old, dark and dingy Anarkali streets my father went to, to buy them. I knew lots of girls in my class who read glossy, new books. But, somehow, that’s just not the same experience! Once you hold a seasoned, colourful childrens’ classic with pictures of goblins, rabbits and witches drawn inside you are bound to examine it. Initially, the previous owners’ names caused disapproval and envy, but eventually this became a fascinating part of the experience. Some Paul, John or Jamila once prowled the book now so lovingly possessed by you. You are part of a ‘tradition’ of sorts, now, a living linkage where ‘owners’ own and are owned by the book it’s rather like buying an old manor house, or farmhouse, with a history of long previous ownership which nominates you to a select fellowship. Sometimes these books would carry letters, chits or phone numbers, too, which would add new mystery and allure. Slowly, as I fell under the enchantment of these old books, I grew uninterested in new ones. New pages lack a past and character, coupled by the fact that new books are incredibly expensive in Pakistan – hence second hand books are always in demand. Every imported book eventually reaches this market, though the price varies by the locality where it is sold. These shops contain newer editions as well. And then additionally of course, there is a huge market of pirated books in Lahore, the pace and effectiveness of which never seize to surprise one. Opposite Hafeez Centre, there are some half a dozen old book shops offering a wide array of old and pirated books at reasonable prices. 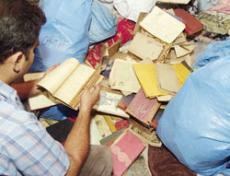 Books on the Anarkali footpaths (very few left now) cost between Rs. 5 to 10 and those in up-town old book shops would be ten times more expensive. So many of my Sundays were spent on these footpaths with my father. The Lahori old book markets cannot match the variety abroad, say in the USA. Americans, unlike Pakistanis, write, print and read many more books. Once they have read one, they dispose off the book which is then available for a few cents in garages, shops and thrift stores. Old books have an exclusive rusty colour to their pages, which give out a unique scent of wood, aging paper and ink. Once I bought a copy of The Secret Agent by Joseph Conrad from the Anarkali footpaths, in which the person gifting it requested the friend he gave it to, to never give the book away or lose it but here it was, barely three years afterwards. It is perhaps not justified to support pirated books. But new books are way too expensive, and the third world public cannot afford it. Plus most of the masters whose classics I have enjoyed (Kafka, Hardy, Tolstoy, Dickens, Austen and many others) have long been dead and ceased to get the royalties. I have quite a problem with books. They need a proper surrounding to be placed in. Beautiful book-racks have always struck my fantasy especially the library in the animated movie Beauty and the Beast. Books need to be treated well, deserve a beautiful (clean) book shelf, a lot of light and regular human touch. You need to open it once in a while and make it feel cared for. I have had to struggle with my own book dilemmas. Are all books equal? Or are the loved ones more equal than the rest? Can you ever really ‘possess’ a book? Or do you just keep it for the next generation? Which book is yours, the one you bought or the one you read? That beautiful copy of City of Djins I borrowed from the library was never mine? What about all the love I bestowed on it during the one week it was on my bedside? And finally, the most potent question disturbing every booklover what will happen to my books after I am gone? Over the years, I have realised that almost everyone I have known so far has rolled out of a book. My best friend is Miss Bennet from Pride and Prejudice, my father has shades of Macbeth, my favourite professor is like Hamlet and my great aunt is a happier Mrs. Dalloway. And I am a Peter Pan, sadly stuck with people who cannot fly. © Copyright 2019 Amma Tiger 1. All rights reserved.